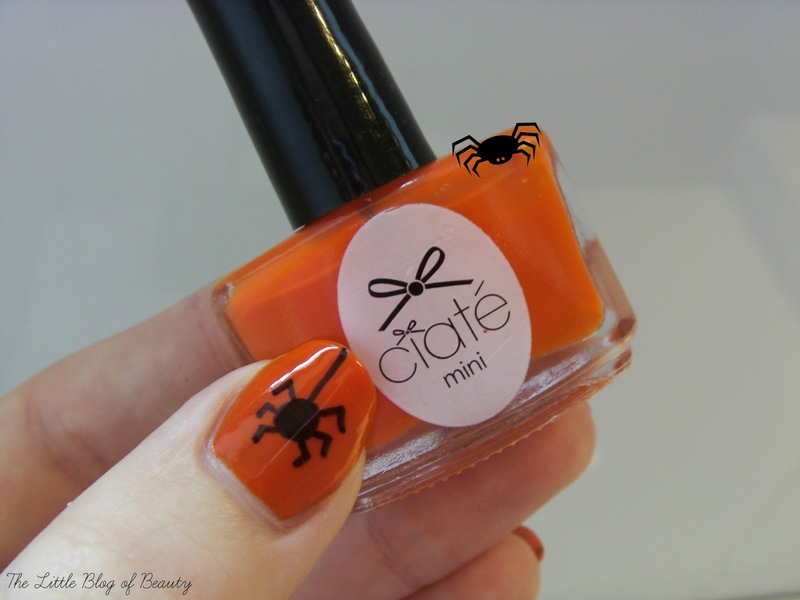 This was actually the first Halloween design I did, but it has ended up as my last Halloween nail art post. I think as I worked on the other looks I got excited about each of those so they went up first. 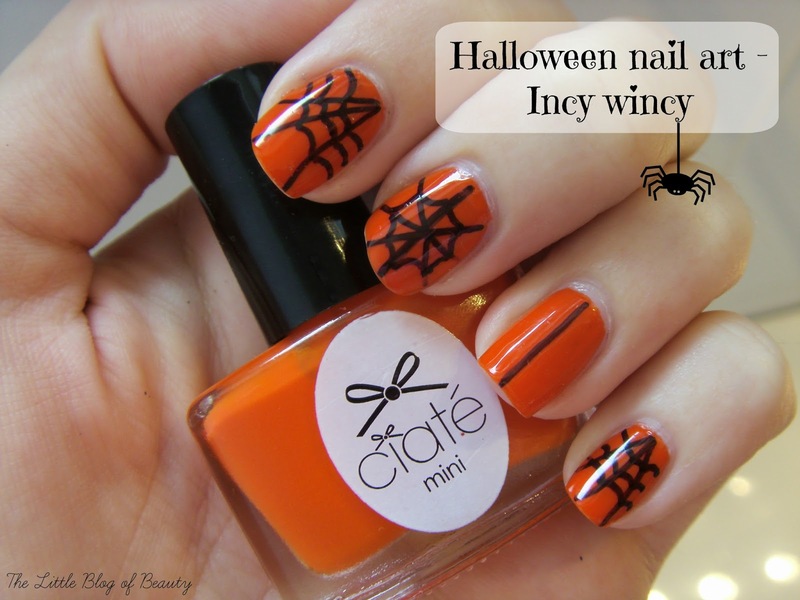 I did a similar design to this one last year with a spiders web, but last time I tried to use a nail art pen and I didn't feel like I had a lot of control and the lines were too thick for my liking. So this year I tried it again with my good old Sharpie. I know, I know, my spider only has six legs, but there is a good reason for that. In my boyfriend's bathroom there's a spider that we don't mind living there, as he's one of those ones with a tiny body and long thin legs, but we were really surprised to discover he only has five legs! I had no idea spiders could live with legs missing, but apparently they can. So now I often find myself getting confused and thinking spiders have six legs rather than eight (I've never claimed to be bright!). So my little incy wincy only has six legs and I think it would have actually been a tight squeeze to get eight on there. I can't actually remember the name of the shade I used as a base for this, and I'm not at home so I can't check, but after a quick look at the orange shades on the Ciate website I think it might have been Hopscotch. As usual I then sealed the base with a top coat before drawing the design on with a black Sharpie and sealing it all with another layer of top coat. In hindsight I wish I'd added a couple of small white dots to make little eyes for him. To be honest I'm not sure why I did the whole spider dangling down across the ring finger and thumb part, it just seemed like a good idea at the time! 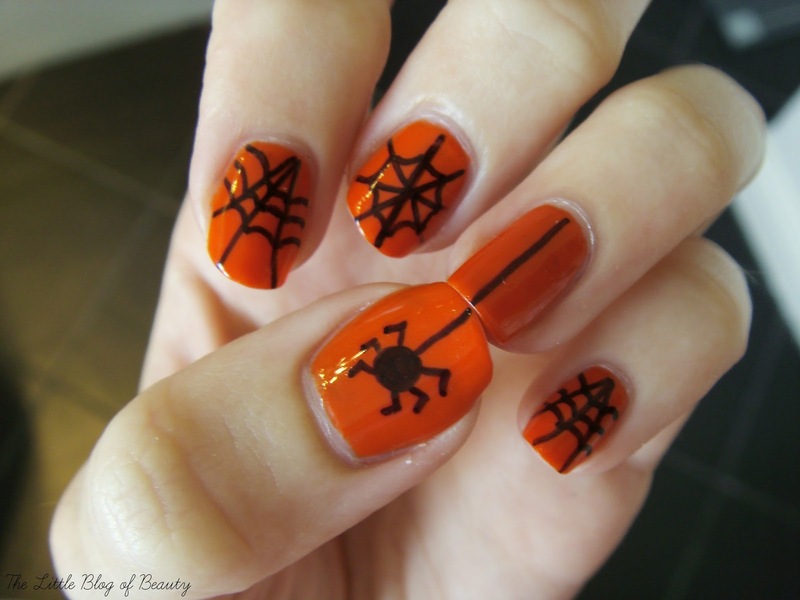 So that's the last of this years Halloween nail art. This weekend I will be attempting a bonfire night based design and then it's on to the Christmas designs (I'm so excited!). What do you think of my last Halloween design?